When the zombie apocalypse strikes, will you be ready? How can you prepare now to survive the undead onslaught? We got the inside scoop from the Green Light Anti-Zombie Squad, a group that's dedicated to protecting you from zombie attacks. 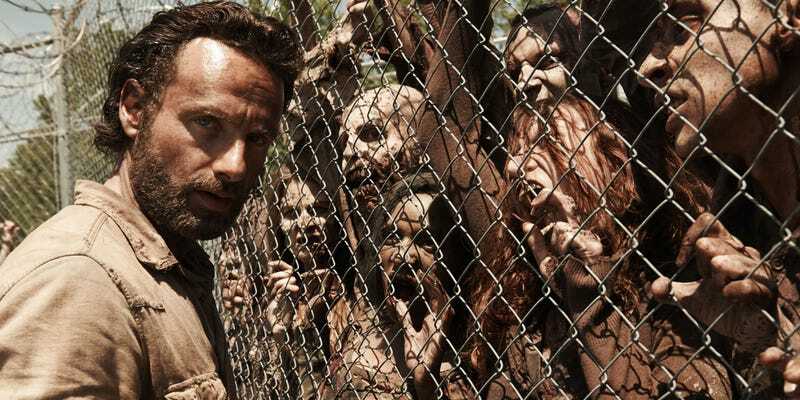 Here are 10 practical tips on how to survive an encounter with the walking dead. The Green Light Anti-Zombie Squad offers lectures and demonstrations to help you and your loved ones survive an army of the undead with your brains (and sanity intact). To ensure you'll make it through the zombie apocalypse, heed their simple tips. There's nothing worse than stepping into a room only to be set upon by a horde of brain-hungry zombies. A team of four armed shooters can easily clear a room if they all stand against the nearest wall: one body in each corner and two in the middle. This position proves optimal for quickly dispatching of a room full of the reanimated. Shambling isn't just for zombies. Three live humans can stand with their backs together and carefully rotate through the room, ensuring that all eyes are facing outward and no one falls victim to a surprise attack. For those lucky enough to amass a relatively large army of live humans, the Fine Line is the best way to fend off roving zombie hordes. Simply form two lines of armed persons, one line in front of the other. Have the front line shoot while the back line holds. When the front line runs out of ammo, the back line steps in while the front line reloads. Tragically, the Squad's training zombie, Billy the Hunter, died while the Squad demonstrated this technique. It's bad enough that you have to deal with the zombified masses, who are tireless, feel no pain, and greatly outnumber healthy human beings. But perhaps even more deadly are the humans who simply can't cope with the new world order. It's best if you keep a psychologist on hand who can identify and subdue such persons before they embark on a murderous rampage that makes the zombies look as ferocious as fluffy kittens. Not all weapons work for all people, and the trendiest zombie-fighting armaments aren't always the best. When in doubt, melee weapons are a fine tool against the undead, but think twice before picking up that giant hammer. As satisfying as squishing zombie skull may be, swinging the hammer creates a sizable arc that gives zombies plenty of time to nibble at your armpits. GLAZS advises that you invest in a machete, which is cheap, lightweight, and neatly separates a zombie's head from its bodies. As for ranged weapons, you may want to reconsider that sawed-off shotgun you're so fond of. Bolt action rifles are both powerful and accurate, without the ammunition restrictions of the close-range shotgun. Zombies have a nasty habit of crashing through glass windows, so it's best to choose a hideout with as few ground level windows as possible. Steer clear of malls, coffee shops, and boutique outlets in favor of Costco, BJs, Sam's Club, or any other large warehouse. If you find yourself trapped in your house, it's best to hightail it up to the attic, which the uncoordinated zombies will have trouble reaching. Basements, even windowless ones, spell trouble. If you're traveling with a group, you may consider fleeing by minivan or SUV, but be warned that the gas mileage and rollover rates might be a literal killer. If you're traveling alone, it's best to take a high miles per gallon vehicle, like a dirt bike, or, better yet, grab a bicycle and escape the zombies under your own replenishable power. Using dynamite around the undead is a tricky proposition; the right amount of explosives can blow them to bits, but you might get cremated yourself. It's better to stave off those desiccated corpse with a controlled burn. But, GLASZ's demolitions expert warns, make sure it's a fire you can contain. A raging wildfire could prove far more deadly than the zombies themselves. 9. Animals: Friend or Foe? Animals can be invaluable allies at the end of the world, but the zombie infection could render them more hazard than help. If the zombie plague is viral, it can infect any living cells, causing even the most inhuman animals to exhibit flesh-craving symptoms. GLASZ members ask: Would you rather fight off a zombie human — or a zombie lion? Perhaps the best way to prepare for the day the dead rise from their graves is to assemble the perfect zombie-fighting attire. Avoid brain spray-back by wearing goggles and covering your face with a non-porous material. Use plate mail or leather to create a bite-proof body suit. Kevlar gloves (provided to some food industry workers) can be worn as is or refashioned into impenetrable sleeves, allowing you to fend off zombie bites by holding up your forearms. Riot shields also add an extra layer of protection and make the zombie head squishing that much easier. A version of this article first appeared back in 2009.